Minutes from the British Museum is a little Japanese restaurant called Abeno, which specializes in okonomiyaki. 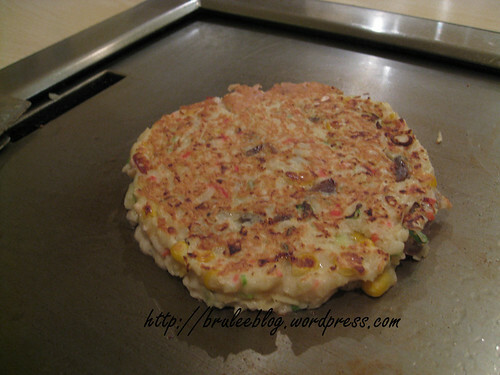 Okonomiyaki is a savory pancake/omelette made with egg and flour, and can be mixed with a variety of ingredients including grated yam, cabbage, meat, seafood and dashi. This is a really small, and busy restaurant. I arrived early and was able to beg my way in for a quick dinner, but reservations are highly recommended – many people were turned away while I ate my meal. 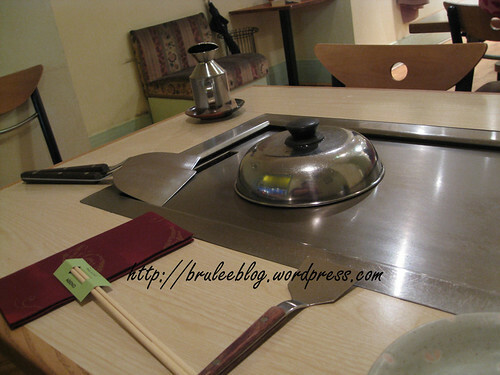 Each table has a built-in gas flat top grill on which the server cooks your okonomiyaki. My order would soon be busily cooking under that lid. The large spatulas were for cooking, and the mini one was for me to use to cut and serve my food. I ordered a small Inaka Mix, which includes pork, konnyaku (a.k.a. konjac) and corn. My server mixed everything in a bowl at table-side. He added a dollop of oil onto the grill, then plopped the mixture onto the hot surface, and quickly formed it into a pancake shape. 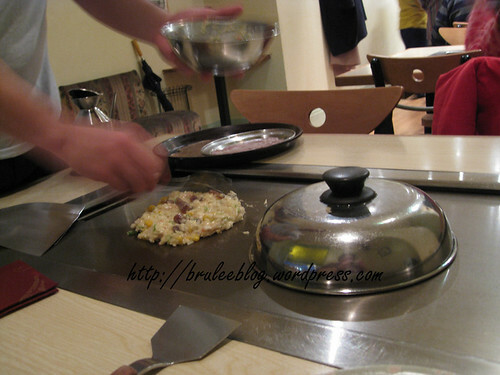 He then put the lid on top of the whole thing to distribute the heat through the whole okonomiyaki. About half way thorough the cooking process he came back and flipped the whole thing over, and placed the lid back on for further grilling. I told my server that I wanted all the toppings – okonomiyaki sauce (close to a bbq sauce), Kewpie mayonnaise, aonori (seaweed) and bonito flakes. They leave you with bottles of the sauces as well as a bottle of hot sauce in case you want a little more to go with your meal. 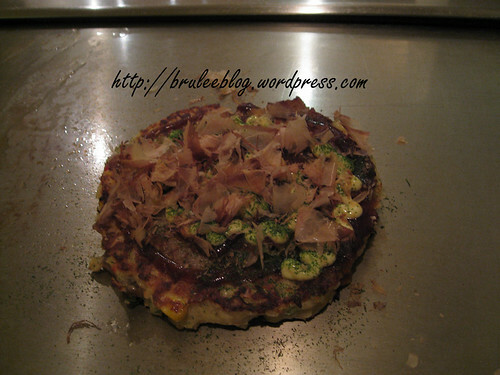 Okonomiyaki - ready for eating! Ok now the really neat part. (Be warned though, I am easily amused. I’m quite pathetic, really.) I had to take a video of this because it’s something that you have to really see to believe. Watch what happens in reaction to the high heat of the grill. It’s short, so you may have to watch it more than once. 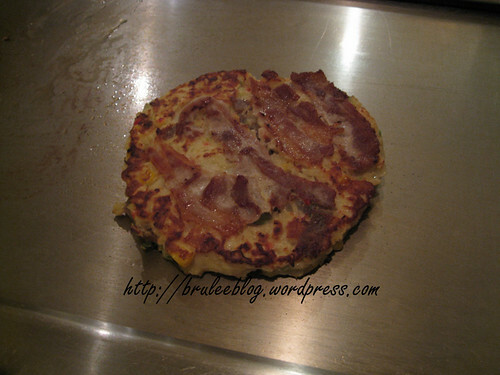 To eat the okonomiyaki, I ended up cutting it up into slices like a pizza. Taste-wise, I have to say that okonomiyaki make a tasty and filling eggy/salty meal. The food, and the restaurant, are perfect for a casual dinner and conversation. Okonomiyaki aren’t the only thing you can order here – teppanyaki and a small selection of onigiri, sashimi, gyoza, etc. are also available. Abeno has two locations – the original Abeno near the British Museum and Abeno Too, located in Leicester Square. The second location isn’t big either, but I find it has more windows and light, and as a result feels a little bigger and less crowded. Didn’t I list this place in one of the e-mails I sent you? If not I’m sorry! I ate there the first time I was in London and loved it, and so I had to go back. I wish there was one of these places around here! i guess that makes three easily amused people 😉 i watched the video three times…yes, easily amused is right. i love bonito flakes, so yummy! never tried this at a Japanese restaurant but it looks tasty with all those toppings. we usually like all the sashimi stuff. thank you for sharing this experience with us. As far as I know it’s not served at any Japanese restaurants in Alberta. I think there might be some in California… but I’m not even sure you can find it in Vancouver/Richmond! I’ve had it in Vancouver at a place called the Eatery. Funky little Japanese place near the university area. Have never been able to find it anywhere else but if Anyone knows of a place in Edmonton that serves it PLEASE let me know. I saw it at the Japanese pavilion at Heritage Days but it didn’t look so hot so I didn’t order any. That has been my one and only sighting of them here in the city!